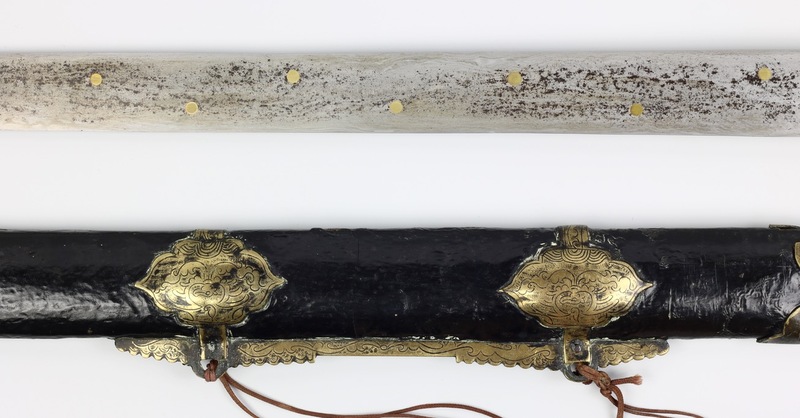 Presented is an interesting Chinese fighting jian with "seven stars" blade. 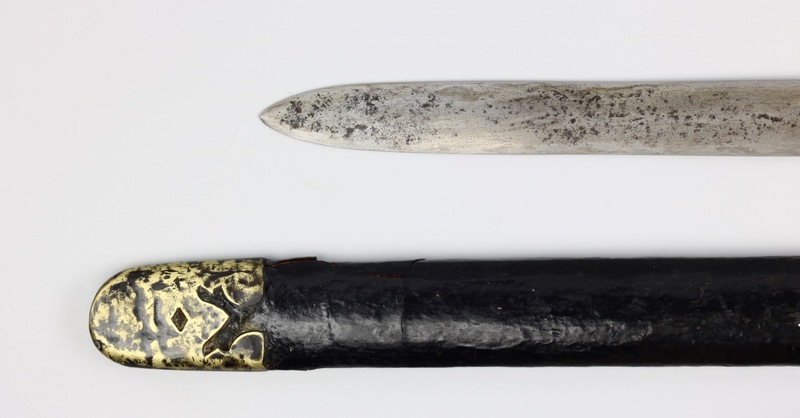 It bears this name because of the seven brass dots inlaid in the steel blade. These represent Ursa Major or the "Big Dipper", a significant constellation in Chinese thought. 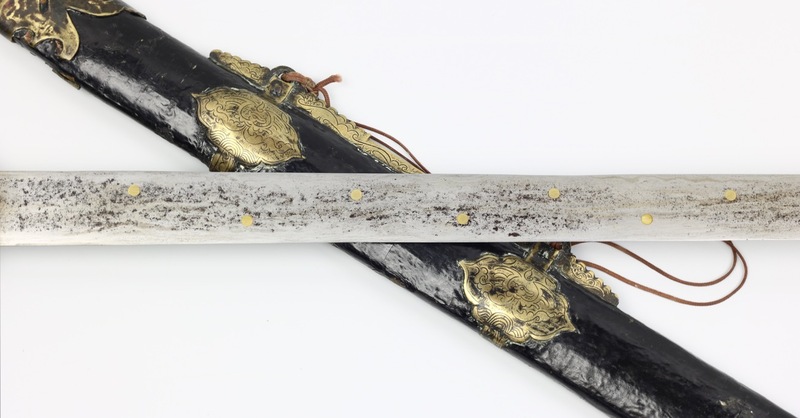 Their layout is somewhat non-standard: these stars usually feature in the middle of the sword's blade with an equal distance from the tip, and the forte. They are also usually evenly spaced. In this case, they start closer the forte and instead of being evenly spaced, the space between two stars decreases ever so slightly from star to star, with the last one being much closer to the former. 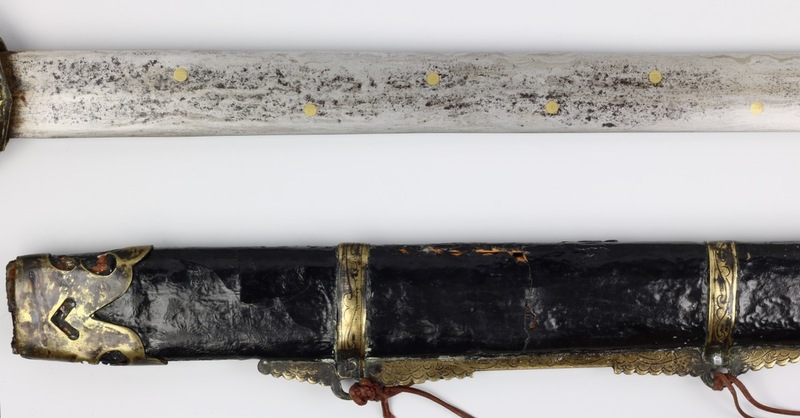 The placement of the stars is not the only non-standard feature of this sword. 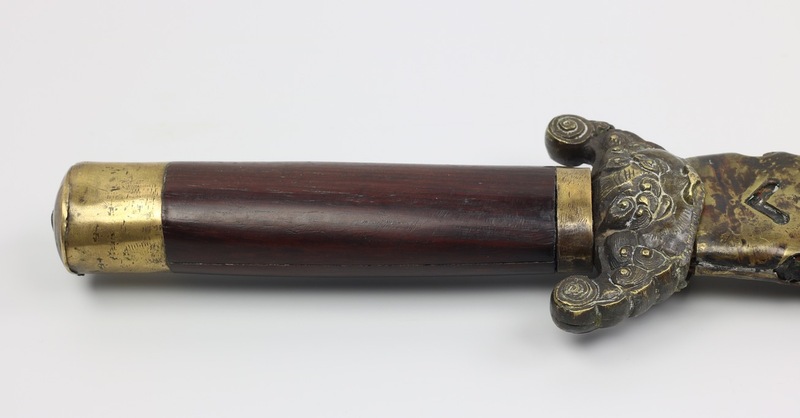 It also doesn't have the bulbous handle commonly associated with straightswords, but instead a straighter, saber-like handle of dark red hardwood. 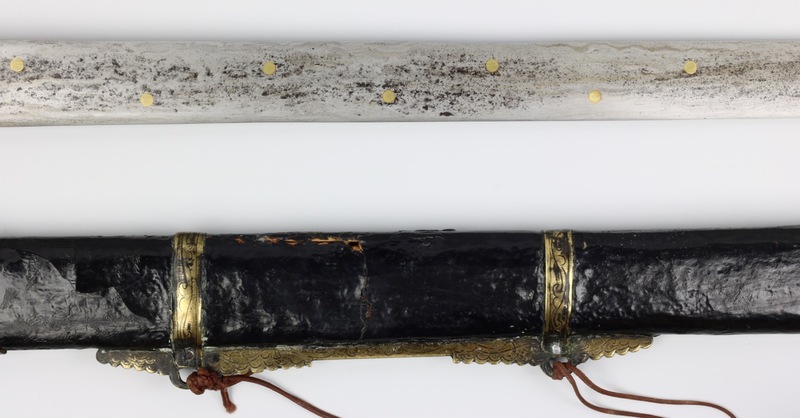 The same goes for the scabbard fittings: the layout is much more like a saber with two suspension bands and a suspension bar holding the original silk cord. Made of good quality steel, cleaned and lightly polished to remove the shallow surface rust. 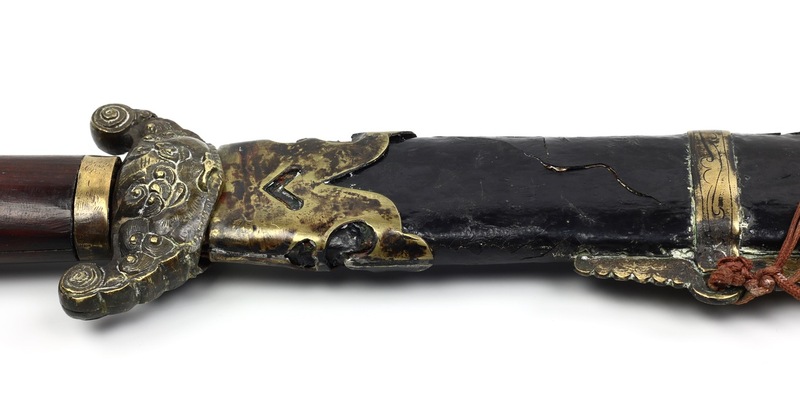 It shows its forge folded construction, with two layers of wrought steel protecting the hard inner plate of high carbon steel, exposed at the edges. The blade is quite stiff for its thickness, giving a gentle vibration when one hits the pommel. It saw plenty of service, when held to the light you see areas where the edge was re-ground, probably after fighting use. It is sharp. With guard of typical zoomorphic form, featuring a monster's head and backward swept quillons decorated with curls of fur. 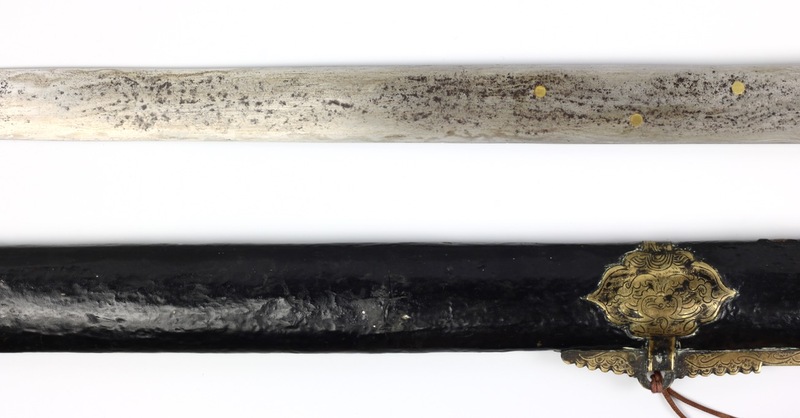 Oddly, considering the simple handle, the guard is of comparatively high quality, much better than most found on other jian . It was cast, and then chiseled and engraved to give it shaper definitions and more details. The monster face has the character 王 ( wang ) meaning "king" chiseled in the forehead, identifying it as a tiger whereas most are Taotie a son of the dragon. There is some light play in the old handle. 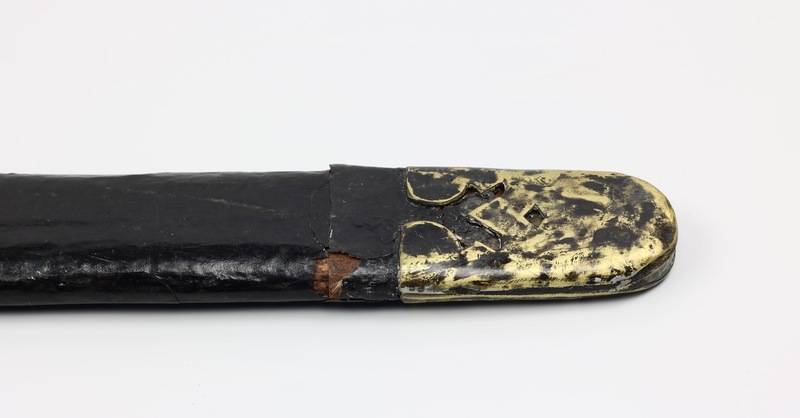 The scabbard end- and mouthpieces are made of thick brass, simple, with rough cutouts. The suspension bar and bands, in contrast, are decorated with fine engravings and stamp-work. Both suspension bands are of elegant shapes and depict archaistic phoenixes rising from the sea with smoke forming. 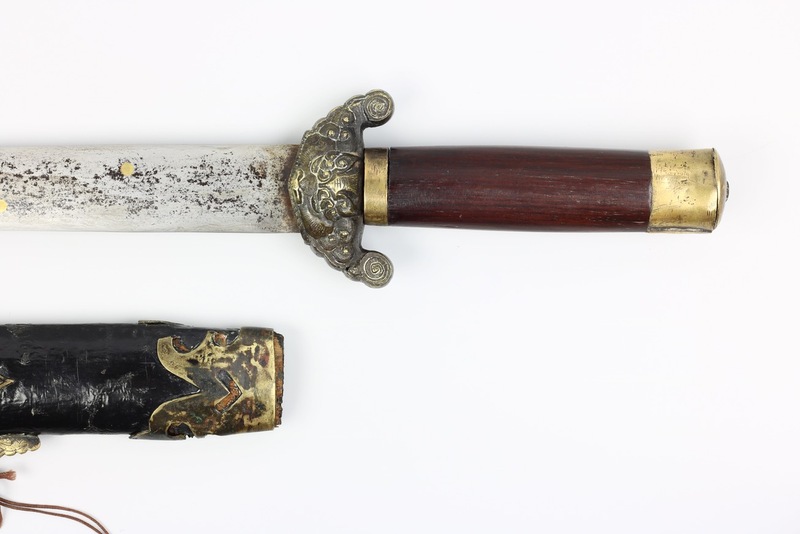 The style of execution was inspired by phoenixes depicted on ancient Chinese bronzes, dating from ancient antiquity, that were collected by Chinese literati, the class to whom this sword probably belonged. 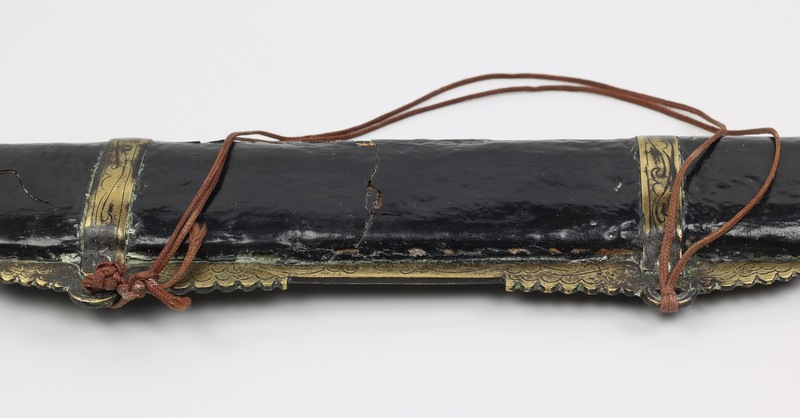 The scabbard lacquer is cracked here and there, requiring careful handling. What sort of people owned these? 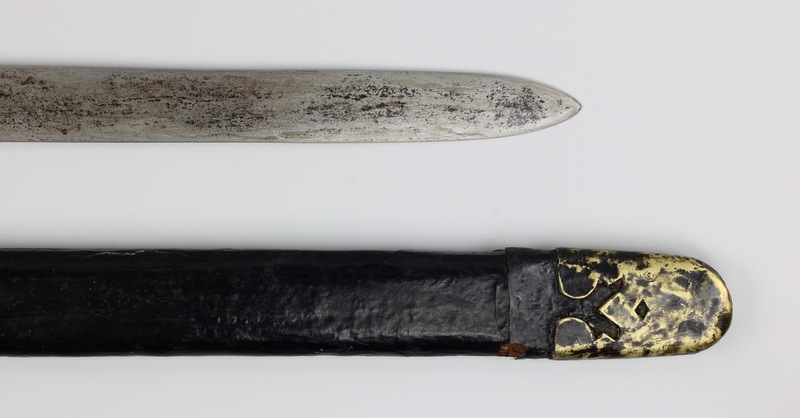 The workmanship and details of this particular jian suggest it was probably carried by a local low-ranked official as a sign of his status -swords by any means were expensive at the time- and for self-defense purposes. These officials were learned men that passed the literary state exams, after which they could be employed by the government in the cities or even the capital, or go back to their hometown where they acted as local overseers. As such they would be in charge of -among others- local police work, training of militia for the crop watch. 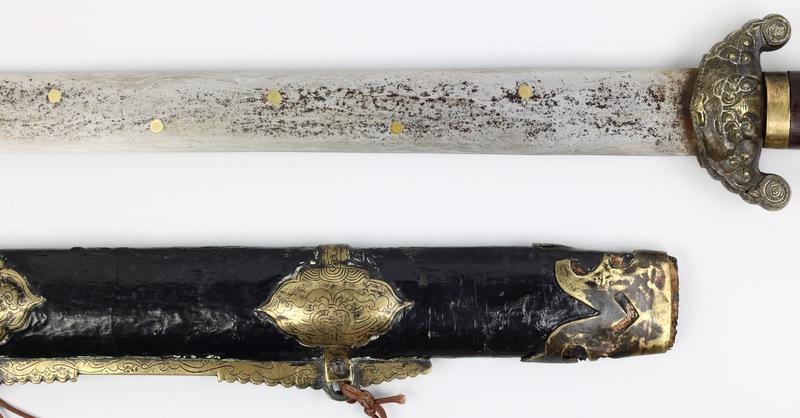 Their weapon of self-defense was the jian , and especially in the smaller villages these local officials had to take care of their own safety. 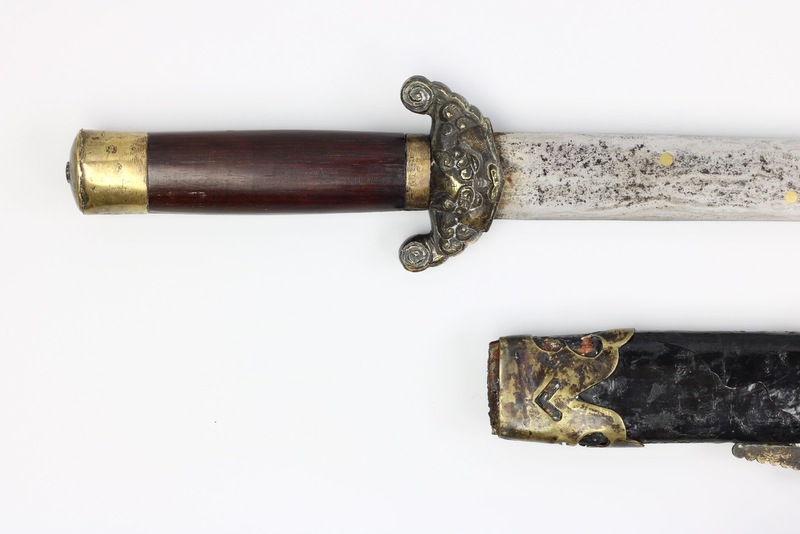 While not of excellent quality or condition, it is a charming fighting straightsword, complete with its original scabbard. 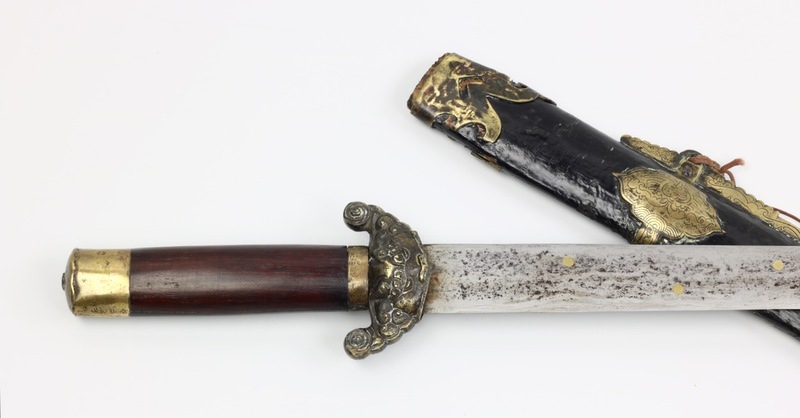 It is a rare, one-of-a-kind piece with many interesting features for the beginning collector, or martial artist that wants to own a genuine antique Chinese sword.